A Pokeball cake was top of middle man's list when it came to planning his 7th Birthday. Middle man loves Pokemon go, and as it gets him out of the house and walking around we are fine in indulging him in it every now and then. It seems that turning 7 is very exciting. We have literally been on a countdown to it from Boxing Day. His Birthday list was full of Lego and he has spent most of his half term assembling his sets. Every now and then he calls me up to find a missing piece and show me a special feature. It makes my heart melt. We celebrated his Birthday with a family swim, followed by Pizza Hut. He had asked if we could do MacDonalds, Kentucky Fried Chicken and Pizza Hut in one day, just like the song. We felt that was a little excessive! For his party, he chose a gynmastics centre and had his friends over. He beamed from ear to ear. 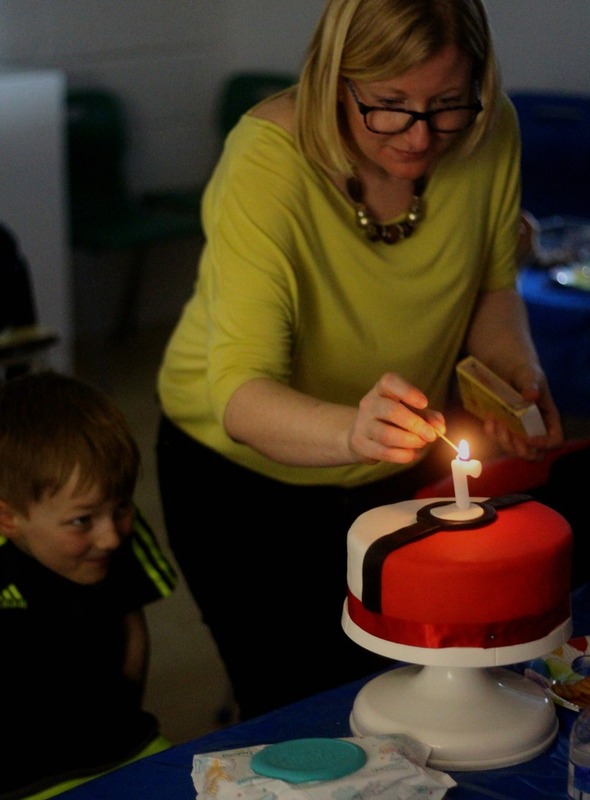 Luckily, his choice of cake wasn't too hard. As half term was sandwiched inbetween his Birthday and his party, I didn't have much time to make it. 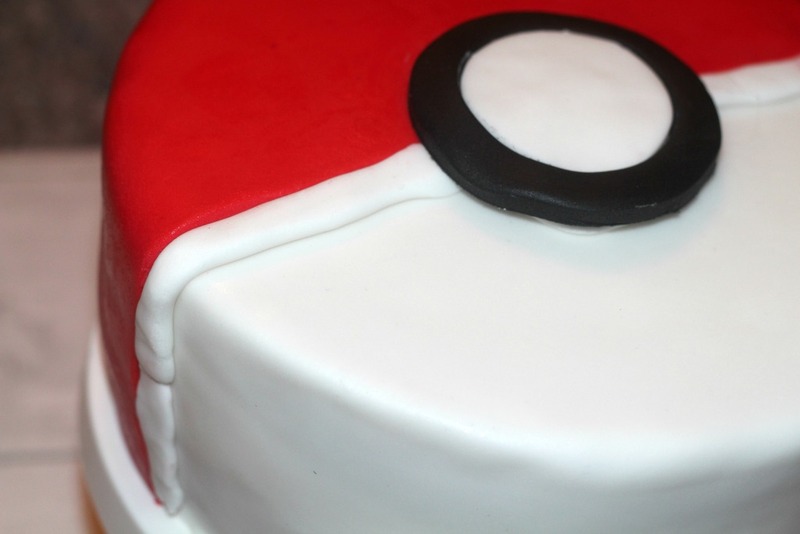 This picture shows you how I leveled the icing up, which I think is the easiest way of attempting a pokeball cake. Mix all the cake ingredients together. I find that it is easier if the butter is melted in the microwave first. Divide the mixture between two 20cm spring form tins that have been greased and lined with baking parchment. To make the frosting mix the icing sugar and butter together using an electric whisk. Sandwich the cakes together with a layer of buttercream and jam in the middle. Spread butter cream over the top of the cake and sides. Scrape off any excess so that the sides are smooth and flat. Place in the fridge for 30mins to harden. Roll out the white icing so it is large enough to cover your cake. Place on top and smooth out. Roll out the red icing so that it will cover half of your cake. Cut a straight line and place it over half of your cake. Use white icing to level the cake where the black middle and centre will go. Cut out a circle of black icing and cut a smaller circle in the centre. Replace this with a white circle of the same size. Roll out a long black strip. Cut the end with the large circle cutter so it fits to the circle in the centre. Add ribbon around the bottom of the cake if desired. I am pleased to say I now have a break from baking birthday cakes for a while! 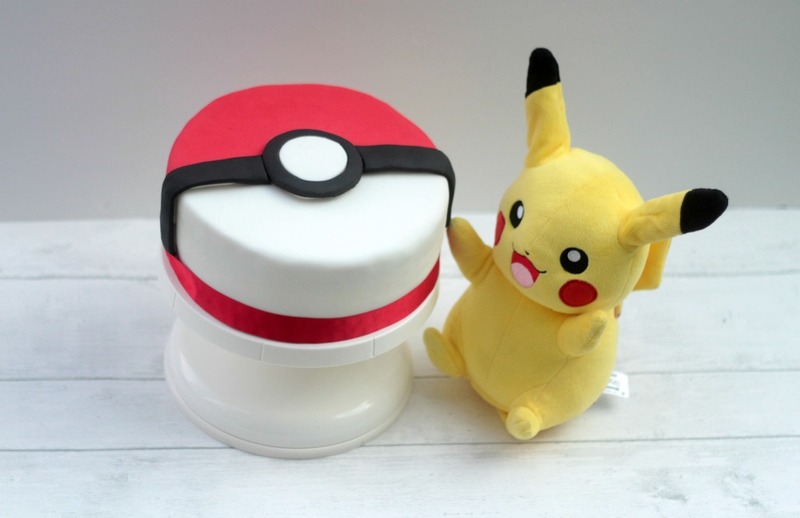 What do your children ask for, for their Birthday cakes?